In today’s cyber world, it’s no longer a matter of “if” a data breach will occur, but “when.” Organizations around the world, from the local corner store to the global enterprise, all need to understand current data security risks in order to mitigate them. 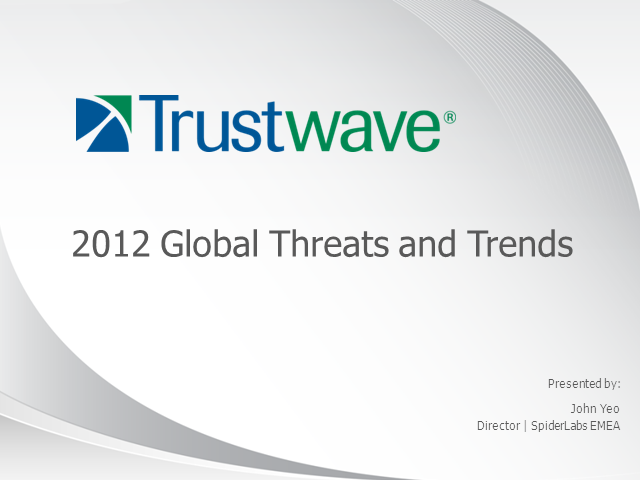 The Trustwave 2012 Global Security Report identifies the top threats encountered by businesses over the past year. Based on an analysis of Trustwave data sources, including more than 300 incident investigations, 2,000 penetration tests conducted by Trustwave SpiderLabs, and 2 million network and application vulnerability scans, the report provides a roadmap for any organization that needs to improve and update their information security strategy. The Trustwave 2012 Global Security Report highlights top data security risk areas, offering predictions on future targets based on analysis and perceived trends. By learning from others’ data vulnerabilities, and applying tactical and strategic change outlined in this report, any organization will be better able to reduce data threats and loss.